Congratulations are in order for MACHINE HEAD guitarist Phil Demmel and his wife, Marta, who welcomed a son on Monday, July 25 at 6:04 p.m. at a hospital in Walnut Creek, California. Wolf Aequitas Demmel weighed in at 8 pounds 12 ounces and measured 22.7 inches. 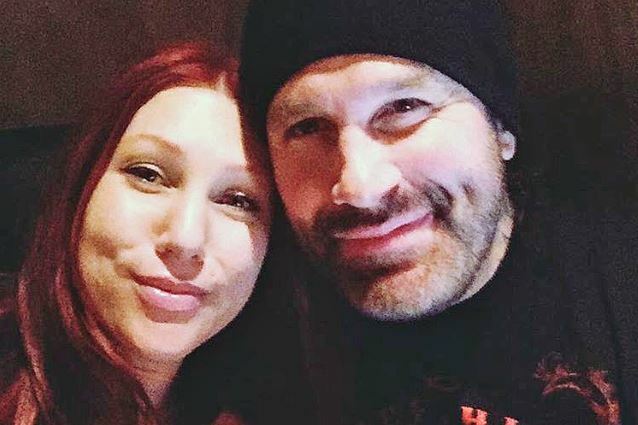 Phil Demmel and Marta, who used to play keyboards for BLEEDING THROUGH, started dating when their bands toured together in Australia and Japan in early 2010. They got married in September 2012 in Las Vegas, Nevada. In an October 2011 interview with Hardrock Haven, Demmel stated about MACHINE HEAD's Australian tour with BLEEDING THROUGH, "I met the girl of my dreams in Australia the last time we were down there. One of the greatest things that has ever happened to me was on that run. I have very special memories of Australia and knowing that I was in love for the first time when I was in Brisbane." Demmel began touring with MACHINE HEAD in 2002 but didn't officially join the band until 2004, shortly before the recording of the group's "Through The Ashes Of Empires" album. Phil was a founding member of the late 1980s San Francisco Bay Area thrash band VIO-LENCE, which also included MACHINE HEAD guitarist/vocalist Robb Flynn. Marta was twice named "Hottest Chick" in metal by Revolver magazine. Hello, my name is Wolf Aequitas Demmel. I was born 7-25-16 at 6:04pm. I'm 8 lbs and 12 oz. and 22.7" long. Can't wait to meet you all.